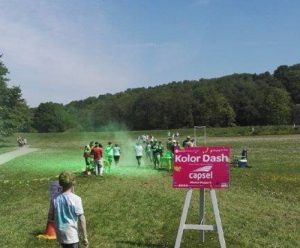 Sunday 20th May saw Capsel join forces with St David’s Hospice at the annual Kolor Dash 5k in Newport. 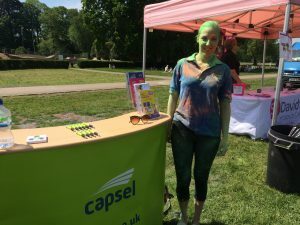 Capsel were one of the main sponsors of the event, supporting the green paint station and covering runners in green powder paint as they ran past. With more than 350 people making their way around the route, the annual 5k fun run raises money in aid of St David’s Hospice Care. With the sun shining over Tredegar Park, the day saw a range of activities take place from food stands, live bands, children’s entertainment and a number of stalls. Capsel were also on hand talking to runners and spectators about Capsel services and the new online estate agency, Capsel Homes – which definitely matched the colourful theme of the day.